Adding curb appeal to your home is an easy DIY project by adding a decorative door glass insert into your front door. This works on steel or wooden doors and you can choose from a variety of sizes and styles. 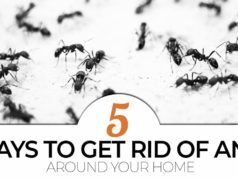 What’s the first thing people notice about your house? Most often the answer is the front entry. Having an enticing and inviting entry is something every homeowner wants (especially for resale) but maybe not everyone knows how to achieve. Recently there have been many DIY trends in adding a pop of color to an otherwise boring front door as a way to attract attention. 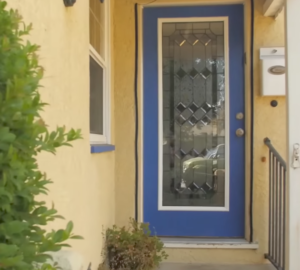 That works, but today I’m going to walk you through how to take it a step further and really add that “Wow” factor to your front door by adding a decorative glass door insert. It’s not as hard as maybe some people would think, and most people could knock it out in just a few hours. Watch the video and follow along and I’ll show you just how easy it can be! Disclosure: This post is sponsored by Zabitat. All views and opinions are my own. Most entry doors are pretty standard sizes (Usually 36″ wide), but there are instances where your door is a different size. 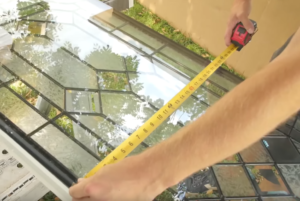 Measuring your door in advance is a critical component in deciding what options are available when it comes to choosing a decorative glass insert. Things to keep in mind when measuring are: Does my door have any existing panels on it? How many? Also make sure you measure the thickness of the door itself as well as the width. Most entry doors are 1 3/4″ thick but some are different. To get started with choosing your glass, decide which product is right for the look you’re going for and will work with your door. 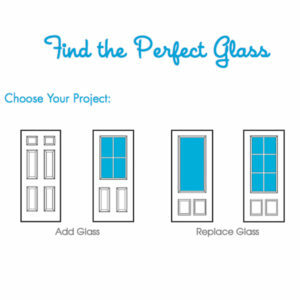 Zabitat has made it really easy to pick the perfect glass with their selection guide. Click here to get started. Zabitat has hundreds of glass options so take your time to choose the perfect glass and frame for your door insert. If you decide to purchase a glass insert, use the Promo Code MRFIXIT15 at checkout for 15% Off your order. Once you’ve selected your door glass and it’s arrived, I like to just double check that the glass will work with my door. Measure twice and cut once, right? Remove the inner frame from the glass and measure from the outside of the screw mounts on the sides and ends of the glass insert to verify the rough opening that will need to be cut in your door.Also make sure to read the accompanying instructions that come with your door glass insert. Now that you’ve verified the measurements of your glass insert and your door and everything is good to go, it’s time to work on the existing door. 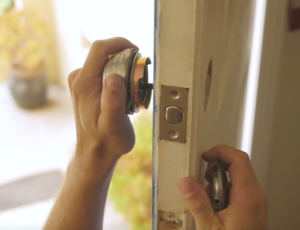 Get started by removing the knob and any locksets installed in your door. Remove the hinge pins holding the door on. 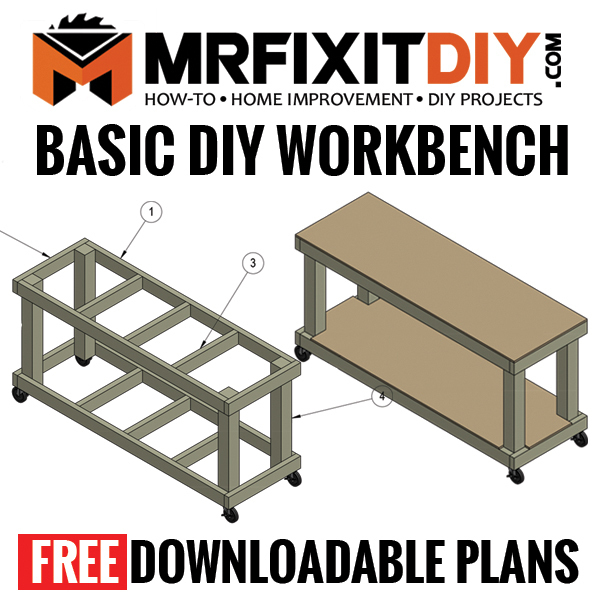 Carry the door outside, or to a work area where you can set the door on a set of sawhorses or flat work surface. If your door has existing glass in it, you’ll need to remove that. 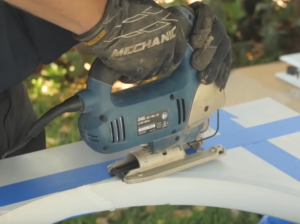 Using a straightedge, a pencil, and a tape measure, lay out your cutout lines. Follow the instruction manual that comes with the door for how to lay out and cut your lines. I like to use painters tape to lay out and mark the lines. The painters tape gives a surface you can mark on and can be easily changed if you make a mistake, and it will keep the finish of the door clean when you’re cutting. Make sure to measure and lay out your cut out lines on both sides of the door. Once you have your layout lines all marked, it’s time to cut out the door. You’ll need a jigsaw or circular saw for this depending on what type of door material you have. In this case, I installed this in a steel door so I used a jigsaw with a metal blade. I made 2 passes (one on each side of the door) to cut out the opening making sure that the blade didn’t go through the other side as I was cutting each side. That just kept the metal from bending and kept a cleaner finish. 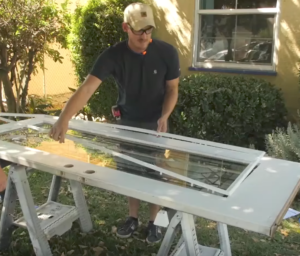 To install the new glass insert, lay it on your sawhorses with the outside frame facing down and then set your door over top of it with the outside of the door also facing down. You may need an extra set of hands here to make sure you can gently set the door over the glass. 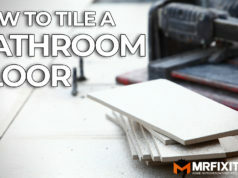 Make sure you have the door positioned evenly in your rough opening and remove the painters tape. Add the inner frame on top and then secure the 2 pieces of frame together using the included screws. The frames also come with decorative caps to cover the screw holes. Lastly you just need to reinstall the door on the hinges and re-install the knob and locksets. You may need an extra set of hands to help you carry the door and re-install it on the hinges as the glass can add considerable weight. If your door is no longer closing properly, make sure the hinges are tight and the door isn’t sagging. You may also need to add some touch up paint to your door if it’s been painted. I hope you guys enjoyed this post and it gave you some ideas on what’s possible when adding curb appeal to your home. If you have any questions or want to chat about your upcoming project(s), contact me. To check out a full list of door glass products from Zabitat, check out their website! Thanks for reading and good luck with your project! Now get to work! NewAir G73 Hardwired Electric Garage Heater Giveaway! 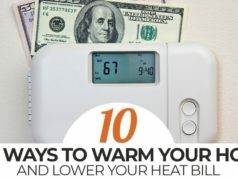 Sign Up to be automatically entered into the NewAir G73 Hardwired Electric Garage Heater Giveaway (a $249.95 value)! One lucky winner will win a FREE Electric Garage Heater. Giveaway entries end March 31st, 2018 11:59pm PDT. Success! 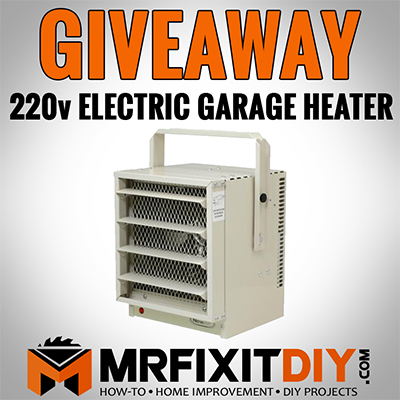 You're entered to win the Electric Garage Heater! Winner will be announced April 1st, 2018 on my Instagram account and will be contacted by me directly via email for shipping information.